Ansty Park, located adjacent to Junction 2 of the M6, will provide 1.5 million sq ft of space set in 100 acres of beautifully landscaped parkland. A substantial part of Ansty Park has now been developed and occupied as detailed but there are still design and build opportunities within the area marked Zone 2. Ansty Park’s accessibility, quality of environment, skilled local workforce and established local and regional infrastructure persuaded Sainsbury’s to locate their store support centre here after a UK wide search for suitable premises. This grade A office complex provides State-of-the-Art accommodation for up to 1,000 of Sainsbury’s senior and creative staff. The MTC represents a £40.5million publicly funded investment which has been developed in response to the Government's manufacturing strategy which sets out an ambitious new vision for high technology manufacturing. A unique collaboration between the University of Birmingham, Loughborough University, the University of Nottingham and TWI Ltd. Working with world-class research partners, across a range of industry sectors including aerospace, automotive, rail, healthcare & ICT; transferring cutting edge technologies into manufacturing processes in industry to bring their products to life. The MTC now have more then 65 industrial members including Aero Engine Controls, Airbus, GKN Aerospace, Hewlet Packard, Nikon, Rolls-Royce, Sandvic & Siemens. The £30 million Manufacturing Technology Centre 2 provides a national facility for ground breaking aerospace research. MTC engineers are working with experts from the world’s aerospace companies on projects which will define aerospace technology for the future. The £36 million MTC Lloyds Bank Advanced Manufacturing Training Centre provides a flagship facility for an advanced apprenticeship programme. Apprentices will learn the latest technology in areas such as intelligent automation, additive layer manufacture, laser machining and welding. In a joint collaboration between Rolls Royce and the University of Birmingham a new £60 million High Temperature Research Centre has been developed. This 62,432 sq ft building provides a unique casting, design, simulation and advanced manufacturing research facility, focusing initially on the key design and manufacturing aspects of investment casting relating to aerospace and other industrial sectors. It also works in education and research with a variety of other partners in the UK and internationally. Manufacturer of the iconic black cab, have invested £250 million in a new facility at Ansty Park. This purpose-built, 350,000 sq ft, research, development and assembly plant will help to prepare for the next generation of ultra-low emission black cabs. FANUC, a world leader in the development of factory automation, have developed a new 129,000 sq ft facility which provides a dedicated research centre for product development and a training suite for staff and client groups. 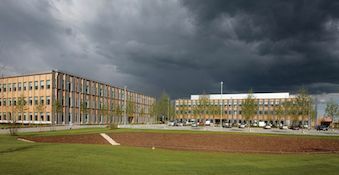 AVL, the world's largest independent company for development, simulation and testing technology of powertrains for passenger cars, trucks and large engines have developed a new 56,512 sq ft test and engineering centre at Ansty Park. This is available to the entire automotive industry and set new standards for innovative technologies. IPG Photonics is the leading developer and manufacturer of high-performance fiber lasers and amplifiers for diverse applications in numerous markets. IPG are building their new UK base at Ansty Park. This represents an investment of approximately £15m. The facility is expected to open in 2020.